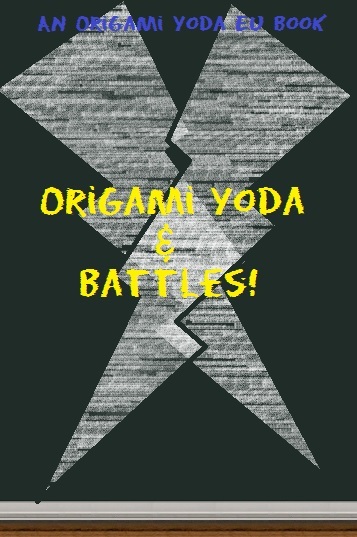 Note from author: This a crossover between Origami Yoda and a REAL thing I do called Battles. Link to the website at the end of the story. So, my mom is taking us on a trip to Virginia to do some stuff for her job and see Uncle Jimmy, for one week! Not wanting us to miss our education, she enrolled Sean and Meghan to the nearest Elementary School, and Katie and I to the nearest Middle School (with fourth and fifth). That school, as it would be, was McQuarrie Middle School! I can’t believe they’re real, even though they are in 8th grade. “Fine with me,” Tommy said. Sara, Kellen, and everyone nodded in agreement. Harvey… was just Harvey. “I am not letting some fifth grader sit at our table. It’ll make us look weird,” he said. “Like we’re not weird already?” Kellen said. “Origami Yoda, what do you think we should do about… this kid?” Sara asked. “Connor,” I said. So I went to the website, and it was amazing. The kid had only five fan stories (one of them his), but he had two followers, and there was that “The Start” story that explained everything! The whole thing, stooky! Even with the doodles of the champions. For a fifth grader, he’s imaginative! “Correction,” Harvey retorted, “I looked at one character, your only evil champion. Twisted Twizzler. Also, Flying Tie, really?” Connor just went into his lunchbox and fished something out; origami, but I couldn’t tell who it was. “This,” Connor explained, “Is Origami Twister, Twister-gami!” There were a couple of ohs and ahs. “I could fold a better piece of origami then that!” Harvey said. “Then why don’t you,” Lance asked sarcastically. “Because I don’t want to,” he retorted. So we changed the subject, and things just went downhill there. So I decided to hang out with Connor, him being stooky and all. So we were just leaving school with some other kids when one came up to us. “Hello,” he said, “I am Arnold.” Connor shook his hand. “Nice to meet you,” he said. I didn’t know why he was acting so nice to a totally unknown kid, but I shook Arnold’s hand anyway. “Maybe we should follow him to his locker, and see what he’s doing,” Tommy suggested. “Actually,” I replied,”That’s not bad.” So we all agreed on who would do what. I think the next chapter will explain better who is with who. me to check out the locker. When I opened it, I couldn’t believe my eyes. There were posters of amazing creative ideas, countless ideas. One of them was buried beneath most of them, barely seen. I pullled it out, and it was a comic idea. Comedy and action was in it, and it was signed by Arnold. I realized that he must have had such a good idea, and was shunned and teased for it. After all these years, he has been scarred, and now tries to get rid of everything creative. Including Battles. Either I stop him, or persuade him to turn back to the Light Side. So we were all doing our job, and for some reason everyone was saying I was annoying. Can you believe that? Suddenly, Tommy and Sara came running down the hall, followed by two other kids with spitballs. “They’re in trouble!” Rhondella yelled. We ran after them. When we made it to Arnold’s locker, Connor explained everything that had happened. Suddenly, there was a whirring sound. Tens of that sound. We all turned, and right in front of us were a bunch of paper air planes, dressed up to look like human dragons. “DRAGMAN!” Kellen screamed. When they started to come at us, we ducked behind the locker door. There were probably about 15 of them, and Connor snuck by them. “NO, don’t!” I yelled. But he sneaked away, unknown to us where he was going. “Why do you get to stop Arnold?” Lance asked. “I’m the one he wants,” Connor replied sternly. I saw Arnold sitting in a classroom, just waiting for me. He took out his laptop he stored on a random desk. It was logged into my account! “Time to finish off your Battles once and for all!” He was hacking my account! “NO!” I screamed. I kicked his spinny-chair backwards, sending him rolling out the door, into the busy hallways, leaving him to be carried away by rushing students. I turned off the computer. I felt bad for him. He had so much creativity, but fell to the dark side. Maybe now was my chance to save him. Connor met up with Lance and Amy, and they all crowded around a computer. When I finally got to see what they were working on, I gasped. It was an entire website dedicated to Arnold’s ideas. All his stories and comics were on there. He actually had some really cool ideas. We showed the website to Arnold, and he completely broke down into tears. He apologized for everything, and, after working on his new website with Connor, they became good friends. Arnold still attends McQuarrie. Connor, unfortunately, had to leave because their trip was over. But Connor and Arnold are always working together on story ideas and comics and such. Connor showed everybody at McQuarrie the power of forgiveness. And a really cool game that McQuarrie will be playing forever. This is great Stooky! I would love to read more! It is Bolt already! I like this story! And I have two suggestions for chacacters! How about Prof. Poppington and Squirrely? Prof. Poppington was made with superglue popcorn and radioactive waste and became very smart. Squirrley was bitten by a radioactive squirrel and turns into a squirrel man when he’s mad. Thanks, but save it for Creationary. if your stooky sauce 2.0 then whos the original stooky sauce?!?! Is Katie (Connor’s sister) going to help a bit? She IS going to McQuarrie with Connor. Oh. Just thought she might. I have a suggestion, how bout Peng Pong, a penguin mixed with ping pong balls and ping pong paddles. he hached from a ping pong ball. How about Darth Invader? Darth Vader was playing Space Invaders and one of the creatures zapped him! Dang it! I’m in the wrong place in the wrong time. JC, find the skittles, please!